The caging of hundreds of kids at our border follows months of rhetoric and rules demonizing immigrants. Kids are in those cages, and they were put there by President Trump. Get past all the debate over immigration reform, all the talk about deterrence and enforcement, all the lies and deceit from an administration that can’t seem to own the abomination it has caused, and that’s what you’re left with – kids in cages. They are scared and crying out for their parents, being cared for by who knows who for who knows how long, solely because the president said so. As Congress begins debating a series of immigration bills, that’s important to understand. There is no law or court ruling forcing President Trump to forcibly separate parents and children who arrive at the southern border – it’s his own policy, changed by his order in April. It didn’t happen under previous presidents, it didn’t happen in the first 15 months of the Trump presidency and it doesn’t have to happen now. Already hundreds and perhaps thousands of children, some of them toddlers, are in U.S. custody, housed in chain-link cages in converted warehouses, watched over by private contractors who are not allowed to touch or comfort children who can’t possibly comprehend what’s going on. He can say he’s only talking about some immigrants, but that’s just semantics. The onslaught of words and images is clearly meant to send a message to his supporters that the country is under attack from people who don’t look like them, and that Trump is the only one strong enough to stop it. This portrayal, unsupported by the facts, has been popular for a while among some Republicans, but it is now the party line – and the official policy of the United States. It was used to justify the Muslim travel ban, the ending of the Dreamers program, and the widespread crackdown on undocumented workers without criminal histories. And now we have kids in cages, and every minute they remain there is a stain on Trump and on the Republicans who have allowed this to happen. Congressional Republicans have reacted thus far by treating the children’s suffering as a bargaining chip. 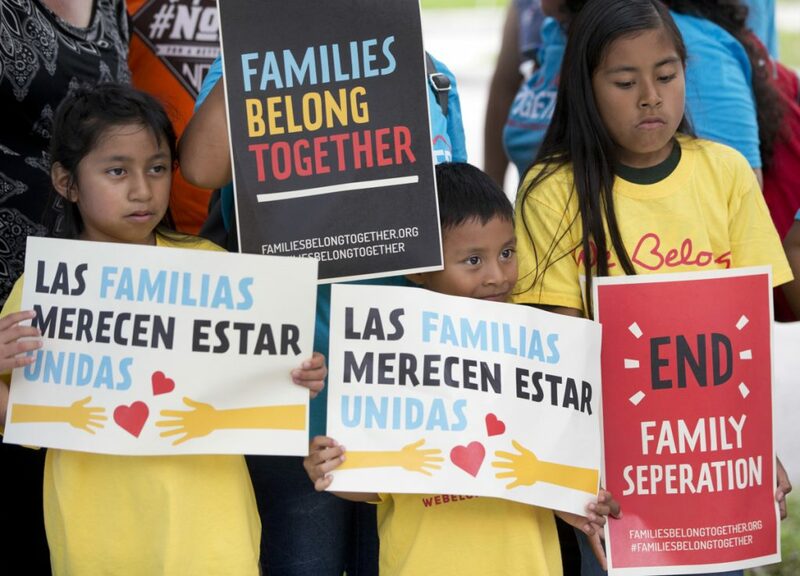 Unlike a bill from Democratic Sen. Dianne Feinstein, Republican legislation seeks concessions on other immigration matters in exchange for the kids’ freedom. It’s hard to say that’s in good faith when the president could end the policy all by himself with one order. In Maine, Rep. Bruce Poliquin has said he disagrees with the separation policy, but stopped short of backing a standalone proposal to end it. That dynamic appears to set the stage for protracted, possibly doomed negotiations. Sen. Susan Collins announced late Tuesday afternoon that she had joined 12 colleagues in asking the administration to rescind the family separation policy while a legislative fix is considered. Whether that pressure works on the president is anyone’s guess. So what happens when legislation stalls, or Trump fails to act? How long do kids have to stay in cages just so they can be used as leverage? The answer should be: Not one second more.